Australian Uranium News - Research: Awsome Video "Could Nuclear Power Save The Planet"
Awsome Video "Could Nuclear Power Save The Planet"
In My Personal View This Is One Of The Best Videos In Support Of Nuclear Power Generation I Have Seen, & I'm Sure All That Watch Will Surely Agree. In the early 1980s Gwyneth Cravens was one of the protesters against the Shoreham Nuclear Power Plant on Long Island, and also participated in ban-the-bomb rallies. After 15 years of deepening familiarity with nuclear power, she says she still would ban the bomb, but she now regrets that the Shoreham reactor was shut down. One concept that altered Cravens’ perspective was realizing what “baseload” requires. Rip Anderson, on the stage with her, explained that baseload is the fundamental currency of grid power. It is massive power constantly available 24/7. It comes from only three sources— fossil fuels, hydro-electric dams, and nuclear. Hydro is maxed out. Fossil fuels have to be cut back to slow global warming. That leaves only nuclear growth to handle the expected doubling of energy demand in the world by 2030. Anderson added that his first scientific discipline was oceanography, so one of his greatest concerns about CO2 loading of the atmosphere is that the resulting carbonic acid in the oceans is dissolving the calcifying organisms and could effectively end the crucial carbon sink that oceans provide. Cravens went into detail about the harm brought by coal, which currently provides 51% of US electricity (while hydro is 7%, nuclear 20%). Estimates are that coal pollution causes 24,000 deaths a year in the US, 400,000 a year in China (not counting the 5,000 who die annually in Chinese coal mines). She also mentioned the still-incomplete science of the effects of low radiation— the amounts below 10,000 millirems. People encounter much higher levels of natural radiation at higher elevations and in some radon-rich areas, but there is no indication of higher cancer rates in those places. The fears of long-lingering cancer effects in the Chernobyl region have not proven out. Comparing the environmental footprint of nuclear versus coal was the most persuasive mind-changer for Cravens. Coal involves vast quanities of mine spoil, vast quantities of fuel, vast quantities of pollution (including mercury and uranium), and vast quantities of carbon dioxide poured into the atmosphere. Nuclear, by contrast, uses the most concentrated form of energy in the world, the plants are small, and the waste amounts to one Coke can per person’s lifetime of energy use. There is said to be no geological repository for nuclear waste yet, but Rip Anderson pointed out that the WIPP (Waste Isolation Pilot Plant) in a deep salt formation in New Mexico has been operating since 1999. It now handles only military waste, but there is no reason except political that it could not take all of our civilian spent fuel. Two questions from the audience addressed possible limitations on fast growth of nuclear energy in the world. One was, “Won’t we quickly run out of uranium?” Anderson said that 10% of US electricity currently comes from recycled Soviet nuclear warheads, and we haven’t begun to draw the energy from decommissioned US warheads. 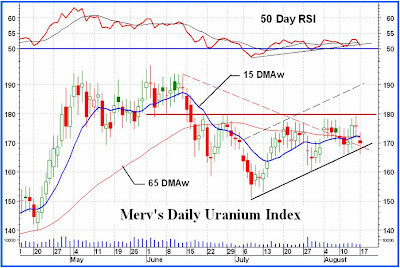 The price for uranium ore has been so low in recent decades that mines closed and discovery stopped. Now that the price is rising, mines are reopening and new reserves are being found. (They’re mostly in Canada and Australia, some in the US.) Meanwhile, spent fuel in the US still has 98% of its energy in it. Once we reprocess the spent fuel the way the rest of the world does, we will extract more of that energy, and the final amount of waste will be drastically smaller. Second question: “Are there enough nuclear engineers in the pipeline to deal with a worldwide nuclear renaissance?” Answer: No. That’s the most limiting resource at this point. Gwenyth Craven’s new book, The Power to Save the World. The uranium spot market was relatively quiet last week, with uranium market consultant TradeTech's U3O8 Weekly Spot Price Indicator slipping just US$0.50/lb to US$46.00/lb after a drop of US$3.50/lb the previous week. There were only three transactions totalling approximately 400,000 pounds U3O8 equivalent registered by TradeTech for the week. eToro is the most recommended forex trading platform for rookie and pro traders.